The first half of 2014 is already in the books, and it looks like a lot of marketers and companies didn’t learn anything from last year about social media. Many brands still made a number of bad judgments and stumbled when it came to handling their social profiles, which led to backlash and a tarnished image for some. Mistakes can happen anytime, and with half the year already over, now is a great time to discuss some of 2014’s biggest marketing and social media blunders so far. With five full months ahead, this should serve as a great lesson for all individuals, brands, and companies trying to market themselves to the public. It’s easy to post things on social media, especially on Facebook and Twitter. Remember, though, that backlash can come just as swiftly and easily. Sure, people make mistakes from time to time, but with all the previous instances, everyone should know by now how not to act in public, especially if you’re representing a brand known the world over. Regrets always come too late, as they say. Before you regret anything, it’s best to be prepared and know what the enemy, or the industry leaders, did wrong. Hopefully, their missteps could serve a lesson for you not to follow the same path. With that, here’s a list of some of the most notable social media blunders during the first half of 2014. Airline giant US Airways figured itself in a doozy of a Twitter fail just this April when it accidentally tweeted a not-safe-for-work image when it replied to a customer. An unhappy customer tweeted her feedback to the airline company, and US Airlines, being the giant corporation that they are, accepted the feedback in stride, saying “We welcome feedback, Elle. If your travel is complete, you can detail here for review and follow up.” The company hit major turbulence, however, when the posted reply included a pornographic image showing a naked woman “playing” with a model airplane. The Takeaway: Think before you click, especially in platforms where nothing is private and information travels around the world in just seconds. It’s great to respond to customers immediately, but don’t let haste ruin it. On a positive note, it’s great that US Airways responds to criticisms online. You should, too; just not in the way the airline did it. Any valid criticism or feedback should be used to improve your products and/or services. Arguably the world’s most famous police force, the New York Police Department (NYPD) launched a campaign in April asking followers and fellow New Yorkers to share some of their most memorable moments with the NYPD through photos and tweets posted using the hashtag #myNYPD. It turns out New Yorkers weren’t that fond of their police force, as #myNYPD tweets were swift and overwhelmingly negative. 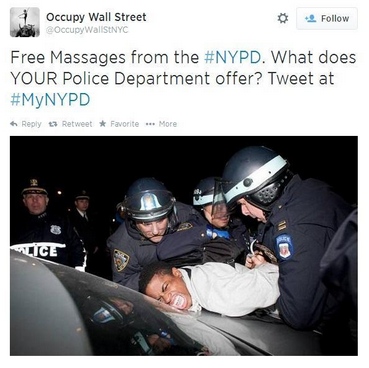 Tweeters posted photos showing police brutality or misconduct, all made by the NYPD. 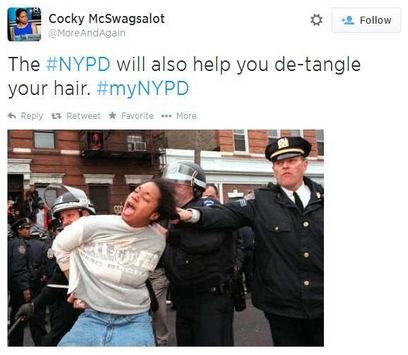 “The #NYPD will also help you de-tangle your hair,” said user @MoreAndAgain, posting a photo of police officers pulling the hair of a woman who appeared to be under arrest. The Takeaway: Just because you created a hashtag doesn’t mean you own it, as one Twitter user put it. Remember that social media is a public forum, and as the Miranda Rights go, anything you say can and will be used against you, albeit not in a court of law. Expect that things can, and will, always backfire. On the flip side, the campaign did achieve its purpose. The hashtag is still active as of posting, and is now used mostly to showcase positive stories involving the NYPD. Actor James Franco might also be able to add “creepy older dude” to his resume after he tried to hook up with a 17-year-old female follower on Instagram. The girl, Lucy, says she was in New York City as an early birthday present. She said she met Franco at his Broadway show, Of Mice and Men. A video of the encounter was posted on Instagram, Franco was tagged, and direct messages and photo proofs were exchanged. The Takeaway: There’s no such thing as privacy on the Internet. Anything you post will be made available for everybody one way or another. Whether it’s a private, direct message to a follower/customer, or a reply to a commenter, always assume it can and will be seen by others and that it’ll make the rounds on social media. Always be careful when engaging followers/customers, no matter what your motive is. During the heat of the NBA Finals Game 1 (both literally and figuratively, as the air-conditioning system for the venue, the AT&T Center, malfunctioned), then-Miami Heat superstar LeBron James took a lot of heat for cramping and bowing out early into the fourth quarter of a game his team ultimately lost. James suffered major cramps, and naturally, social media unleashed a barrage of tweets, jokes, and disses directed at the four-time MVP—which they aptly dubbed #Lebroning. One brand caught in the crossfire was sports drink giant Gatorade, the official sports drink of the NBA. Tweets flooded Gatorade asking where they had been when King James was in trouble. Naturally, the beverage brand defended itself, saying they weren’t a sponsor of James. “The person cramping wasn’t our client. Our athletes can take the heat,” replied the beverage brand. Asked by a user where they were when James needed them, Gatorade replied “we were waiting on the sidelines, but he prefers to drink something else.” James endorses Powerade, Gatorade’s rival. The Takeaway: Always be sensitive about certain situations, trends, or happenings. While Gatorade managed to defend their brand and make themselves look better, they ultimately realized their actions were a bit insensitive, especially after a lot of online users called #Lebroning posts mean. Also, their replies may have backfired a little after speculations surfaced saying King James may have been drinking Gatorade throughout the game. The World Cup is an event where dreams come true, and in this year’s recently concluded games, aside from Germany, a Belgian female fan’s dreams came true…almost. 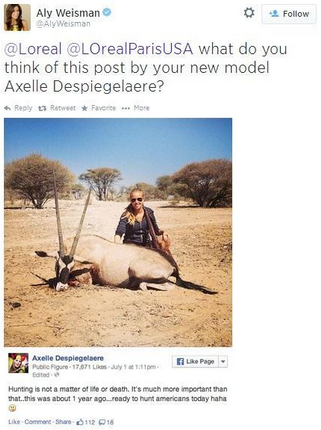 17-year-old Axelle Despiegelaere scored a modeling contract with L’Oreal after cameras zoomed in on her in the stands during a World Cup game and photos of her went viral. The girl, however, was dropped by the cosmetics company after Despiegelaere posted a photo on Facebook which many dubbed offensive and inappropriate. Her post came right before Belgium played the US team. A user posted a screencap of the photo and sent it to L’Oreal’s Twitter accounts. Naturally, she received major backlash from online users. L’Oreal responded, saying they only hired Despiegelaere for a project, and that it was finished. She has since deleted her Facebook page. The Takeaway: Be careful when joining the online crowd’s fanfare, especially when emotions are high. Things you may deem funny or appropriate at the moment may actually turn out the opposite in just a few hours. As with the previous examples, it’s not too hard to screw up a good opportunity, especially with the growing prominence and reach of social media. Social media is a double-edged sword. Use it properly and it can do wonders for your marketing campaigns. Do something wrong, however, and it can be a very unforgiving platform. Take a wrong turn, say something inappropriate, or just click the wrong button and you could be haunted by that mistake for a long time. Hopefully, with these examples and lessons, you won’t have to. Clayton Wood is the marketing director at SEOReseller.com. He has spoken at several online marketing conventions, and is passionate about helping companies and entrepreneurs keep up with the latest best practices in digital marketing and SEO. Connect with him on LinkedIn. Good post! The recent debacle with Southwest (kicking the man off the flight for complaining about a gate agent) is noteworthy as well. I thought this was the best tip in there: “Anything you post will be made available for everybody one way or another.” If it’s digital, it can potentially be shared to ANYONE, so be prepared for that. Tweeting can get you in trouble! I know everyone’s only human and there will always be mistakes made, but sometimes it just takes some common sense and some focus before brands address situations in public domains. Great list of social media blunders Clayton, thanks for sharing.